Last week we introduced you to the first of three families who have abandoned the advised route, along the motorway, to pursue a more adventurous and footloose lifestyle; and now we want you to meet another such crew. As someone once remarked after meeting the Mollymawks, “There’s more than one way to skin a cat”. I like my cats unskinned… but you get my drift: There’s more than one way to go cruising with your kids. If Mike and Alisa are following the normal path in a ‘not normal’ scene, aboard their yacht, Galactic, the second family that I want to introduce you to are on a narrow trail leading up the steepest cliff. Pretty much the only thing that James Burwick and Somira Sao have in common with Mike and Alisa, apart from the fact that they live on a boat, is that they’re also American. James, so far as I know, is the son of sons of that same soil, but Somira’s parents are from Cambodia and she was born in a Khmer Rouge work camp. 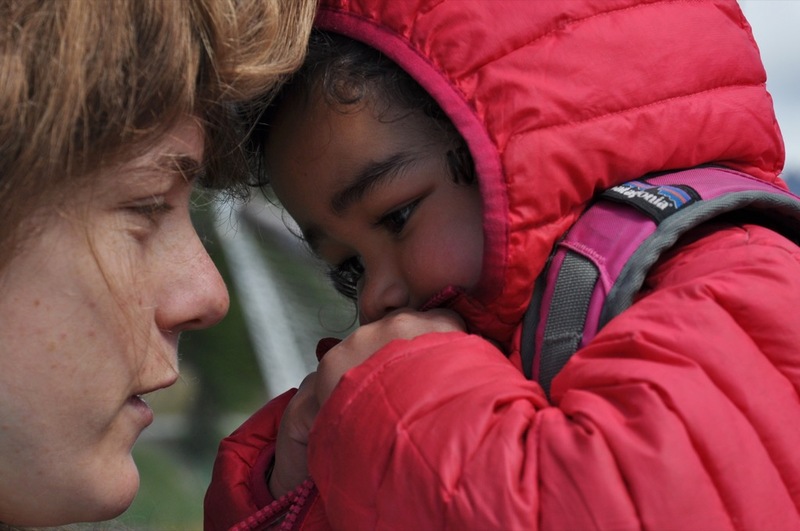 When she was four years old the family escaped from the camp and somehow managed to flee to the United States. Whenever anyone says something rude about the Syrian refugees or asks, “What do they think they’re doing making families when they don’t even have homes?”, I think of Somira. Like most Asian woman, she wears a cheerful smile at all times, and it’s a smile of complete contentment. She wears it whether it’s sunny or snowing; she wears it still when her youngest daughter is having a spectacular tantrum in public; she wears it while lugging two suitcases and the said child across three boats to reach terra-firma. She was probably wearing it when the family capsized their boat off Cape Horn… Whether because of her upbringing in that camp or through genetic fate, Somira is as soft as rose petals and as tough as nails, simultaneously. She needs to be, because, as I say, she and James have chosen the hard, untrodden path for their journeys en famille. Whereas most cruising families live aboard a yacht which was designed for plodding comfortably across the sea, James and Somira and their kids live on a racing machine. 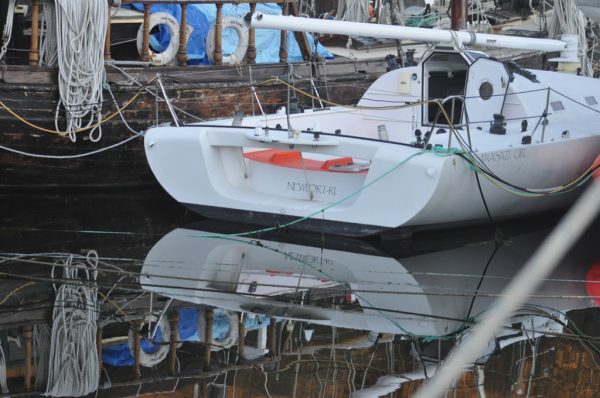 Anasazi Girl is an Open 40 – a carbon-fibre composite, designed for single-handed sailing. 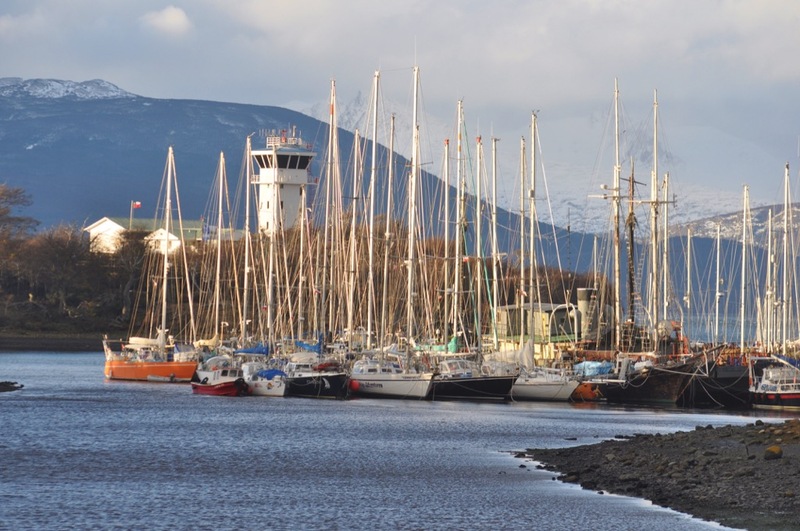 James had already sailed her solo around the world before he met Somira. 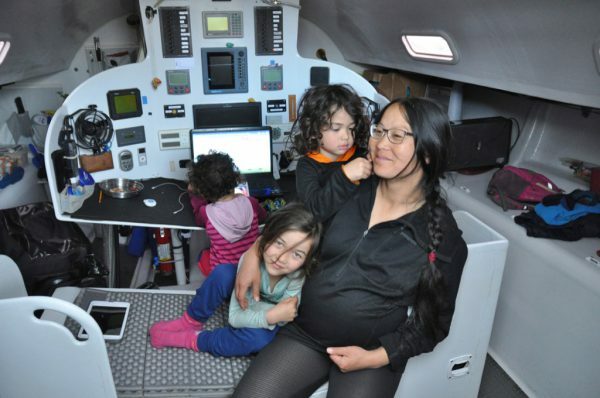 The boat doesn’t have much in the way of an interior, because interiors weigh a boat down and kill speed, and nor is there much room for toys and games; so the Anasazi kids spend a great deal of their time piled onto the seat in front of the navigation console watching movies on Dad’s computer. As James and Somira are quick to explain, they are not your standard liveaboard sailors. The fact that they’re travelling around the world aboard a sailing boat is almost incidental. Their true mission, as Somira explains, is to give the kids a “wild and outrageous life”. They refer to this as “experiental education”. Essentially, it’s much the same same thing that I’ve mentioned for Elias and Eric – and, indeed, for our own three kids – but whereas our emphasis has always been on self sufficiency in both material and intellectual terms, on cosmopolitan attitudes, and on environmental concern, for Anasazi’s crew it entails a more high-brow approach. 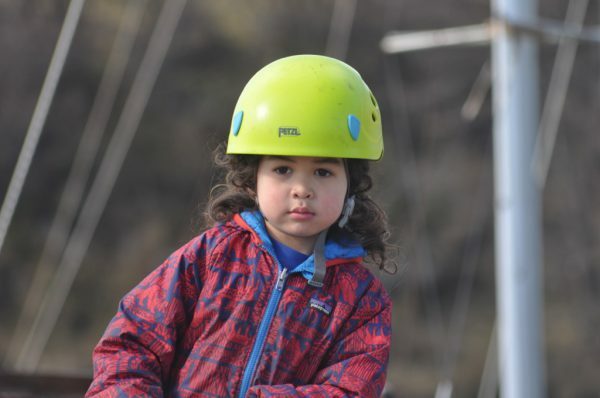 James and Somira aspire to immerse their kids in a society of mountaineers, skiers, and other extreme-action characters – people who, as Somira would have it, “push the limits in their lives”. In the course of pursuing this ideal the family has travelled across Patagonia and the Atacama desert by bicycle, spent time journeying on horseback and in kayaks, and sailed half way around the world in their high-speed over-sized racing dinghy. In short, they, too, have pushed the limits. Some would say that this is all very well but that small children shouldn’t be exposed to the kind of risks that such ‘pushing’ involves; and as demonstration of this argument they point to the fact that the family have come unstuck. I’ll get back to this in a moment – but first I want you to meet the kids. When James and Somira set off to girdle the world, there were only two small children in Anasazi‘s crew: Tormentina, also known as T-bird, was four years old, and her brother, Raivo, was two. 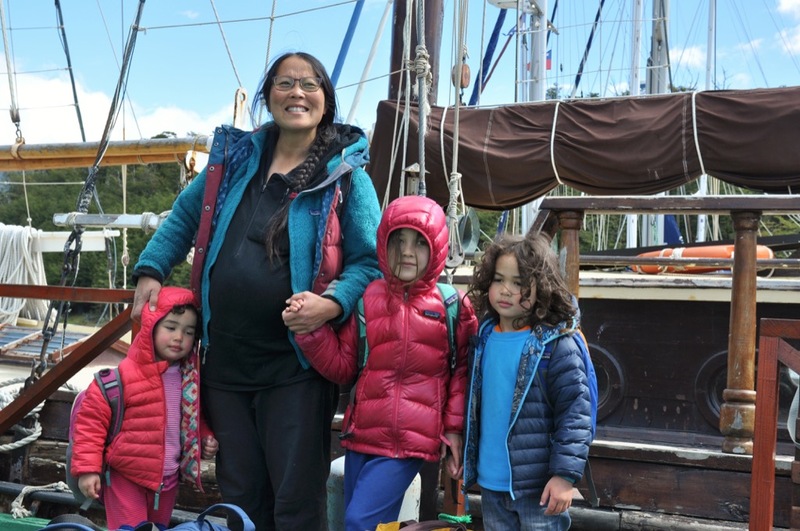 Having sailed from America to France, and then down and around the Cape of Good Hope to New Zealand, the family broke the journey for just long enough to let Pearl pop out into the world. And as if three kids on a small boat weren’t enough, the team has now been augmented by the arrival, some months ago, of Tarzan. Tarzan was born in Chile, and he was born there because that’s where the family happened to be; and they happened to be there because two years earlier they broke their mast off Cape Horn. The gale which took Anasazi Girl‘s mast also dealt the same blow to a single-hander voyaging in a ‘standard’ cruising boat, and both crews were rescued by the Chilean navy; but, despite the fact that they were not the only ones to come to grief, James and Somira have been censured for taking their kids sailing in “an unseaworthy boat”. Censured, and grounded. 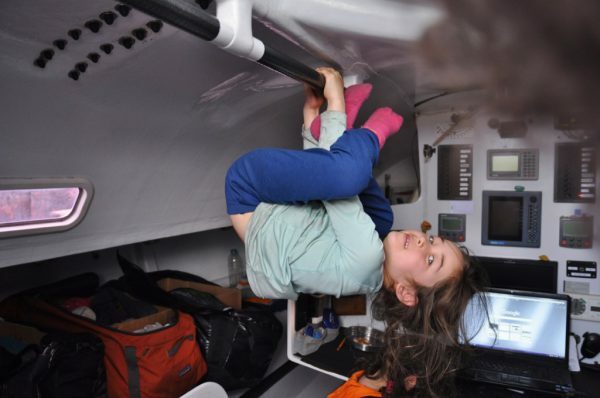 Whereas James would have liked to rig a jury mast and leave Chile on the next fair wind, the authorities have said that he can’t set off again with his family until the boat has been properly re-rigged and has passed an inspection. James and Somira had – and still have – every confidence in their boat. Before the accident, whenever they were accused of living dangerously James would reply that they practised risk management. The boat carries all manner of electronic doo-das designed for summoning aid in an emergency, and none of the family ever went on deck at sea without first donning a harness. In the aftermath of the rescue, people have been seen to shake their heads and mutter things along the lines of, “I told you so!” Well, my view is slightly different. I wouldn’t have taken my kids cruising in a fin-keeled skimming dish, because I do believe that such a design is inherently unseaworthy, BUT, when all is said and done, the fate which befell James and Somira and their kids was no different from that which befell us, 20 years ago. Our boat, Maamari, was the definition of seaworthiness – but she still capsized and we still had to be rescued; so, I’m not wagging my finger at anybody. In my view, those two options are both radical, but between them lies a whole array of compromises. To continue the analogy, there’s also the option of using an old ridge-tent or a VW kombi, or something between those two – and I think that if James and Somira were to relax their ‘pushing’ just a little bit, they’d experience a lot less stress and have a lot more fun living ‘experientially’ with their kids. Mind you, they seem to be having plenty of fun anyway! This is the second of a series of three articles. The next article will be published next week. The first article can be found here. The story looks like the one of s/y Messenger (http://coconuts.is/ ). Parents with 4 kids on board in a race sailboat WITHOUT an engine. We arrived at the same day in the harbour of Cuxhaven and had a hard time taking a berth. They arrived after us but were befor us on shore.